In my research travels I come across many photos which are interesting but don't fit with what I'm researching. I file these photos in my idea file because they're too precious to let go. They are valuable insights into the fashion and events of their time. 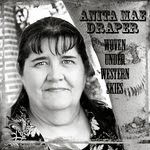 Keeping the above in mind, take a look at the following photographs. Do any of them appeal to you? Well, what do you think? Do any of them spike your interest? I'll give everyone who wishes a chance to answer in today's comments, then on Wed I'll add an update with whatever information I have on the above photographs. Anita's Note: My first thought was that Gus was reading a Dear John letter as noted by the intensity on his face. However, being an emigrant, he may be receiving bad news about his family still back in 'the old country.' 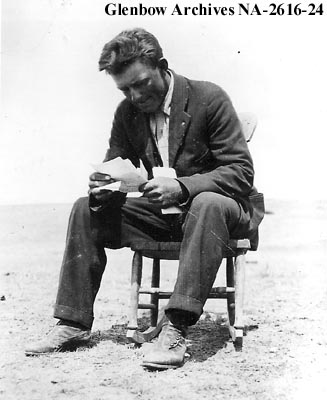 Also, many people were illiterate back then and he may be struggling to read. Description: July 24 to August 4, 1911. Note women's shoes in foreground. 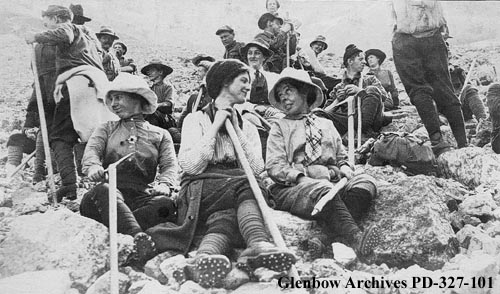 Anita's Note: If you're interested in women's fashion, activities, and leisure concerning this topic, click the link to the Glenbow Museum. Then at the top right of the screen where you see the SEARCH box, use the pull down menu to choose PHOTOGRAPHS and click the arrow. A new screen will open with more search boxes. Type "alpine club" in the keyword box and hit ENTER. Enjoy the pages of photographs. If you want to try again, perhaps search for "women's clothing" alone or something, click the link for Search Again and it will take you back. (Don't click your browser's back button because the page will have expired.) The Glenbow Museum pages will always show the earliest images first, and then progress through the years to the most recent ones. Anita's Note: It's hard to date photos of children since they grow so fast and then their clothing is passed on to another child without too much wear except perhaps knees and elbows. Back then, children wore whatever clothes they had without a question of what was in fashion. Their shoes are not buttoned up, so that would indicate 20th century. If you guessed anywhere from 1910-1940, I'd say it was a good guess. The newspaper banners aren't really a help at figuring out the location because Chicago was a central distribution point to Western Canada from the east. Although I haven't been able to confirm this, I believe the Saturday Globe is the weekend edition of Toronto's Globe and Mail which is still sold across Canada. PHOTO # 3: The photo of the boys with the Chicago Ledger and Saturday Blade (which has sod all to do with the Toronto Globe) is holding the 26-April-1913 issue of the Chicago Ledger, which dates this photo perfectly. The CL was a weekly paper, nationally distributed. 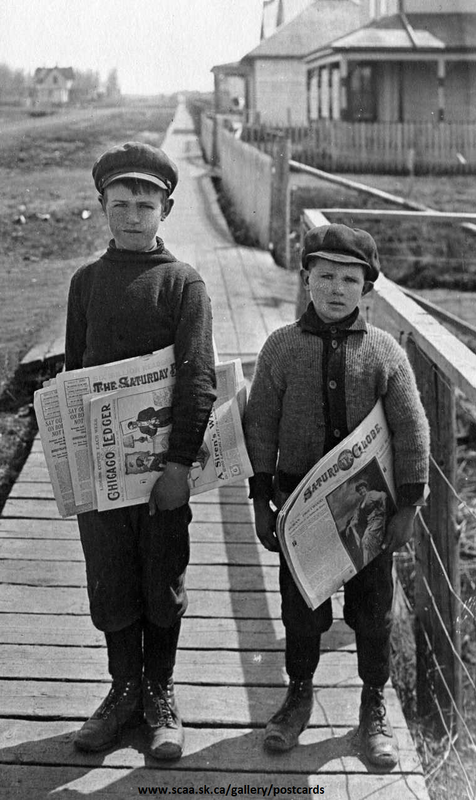 This paper was only available rurally within a two-week window of the publication date, depending upon the location of the boys in this photo. Naturally, the closer to Chicago, the narrower that window of time becomes. Oh. Incidentally, the fiction serial on the front cover of the Chicago Ledger is by Mason Ray, being "A Siren's Wiles, or, Who Laughs Last." Shame. I actually am missing this issue in my files. Thank you for sharing this information, Companion Fanatic. I really appreciate you taking the time to fill us in. 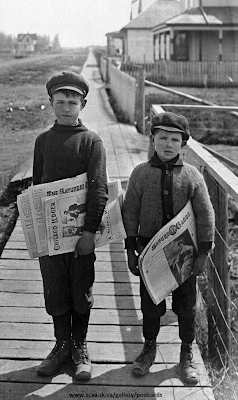 On a personal note, I'd love to talk historical newspapers with you. If you'd like to do the same, please contact me via the Contact page on my website. Description: Pedestrians and streetcars on corner of 11th Avenue and Scarth Street. Imperial Bank of Canada on northeast corner, old City Hall in background. 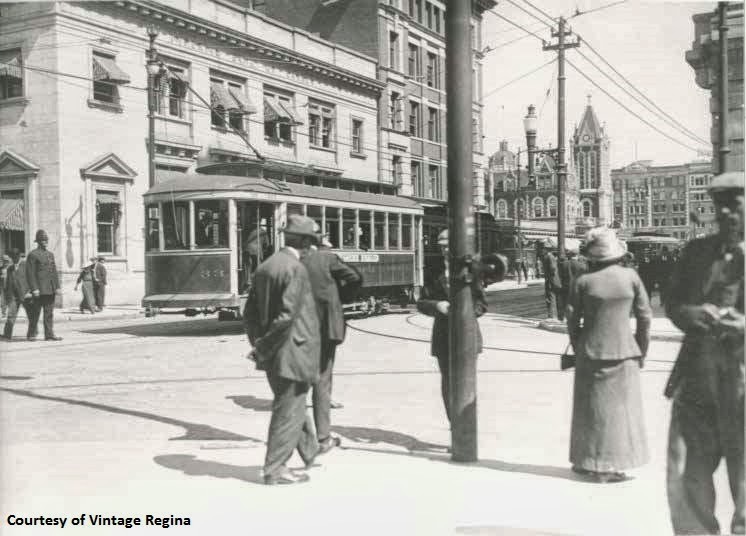 - Regina's inaugural streetcar run was on July 31st, 1911. Since several people in the photo seem to be looking toward the streetcar, I'm guessing it's still a fairly new sight to them. - If you look at the length of the skirt of the woman with her back to us, it would seem to be around 1900. Her hat is still a floppy one worn into the early 1900's, and not a cloche or flapper hat from the 1920's. Also, she appears to be wearing a corset, which was slowly going out of fashion in the Edwardian period of the 1st two decades of the 20th century, but since most women don't buy/wear the latest fashions every year, it wouldn't have seemed out of place pre-World War 1. - Why did the photographer take this shot? The first thing I noticed in the photo was the woman's back where you can see her corset. Is it because she's hunched over? Or is she actually wearing some type of body cast? What is the fabric content of her outfit that makes it drape that way? Was the photographer a man or woman? I have to admit, that if I was walking down the street and saw something odd or funny - like the woman's back - I would snap a pic right there. - There are many Vintage pages on Facebook, such as Vintage Winnipeg, Vintage Lake Simcoe, Vintage Toronto, etc. Perhaps their is one for your location. Photo #2 caught my attention the most. Females in the goldrush? Female miners? Dina, my first response was to ask which gold rush because that would determine which timeframe you're thinking, but no, the ladies aren't miners. That's a very good guess based on their pick axes, however. I'm only familiar with the '49 gold rush in California. Anita, these are fabulous. I love them all! #4 looks to be very early 1900s on the busy city streets if Regina. #1 the guy looks like he's reading a letter from home, and I want to say 1950s.I think he's happy for the letter, but misses his family. The ladies with the pick axes - if they aren't miners, perhaps they're helping to break up the rocks so a house can be built? They look like they're having fun! I can't guess the year. The little boys were the hardest for me. Perhaps the 1820s? They don't really look happy. Or perhaps they're just curious about the photographer? I was drawn by the little boys. I was curious about their families and the need for every penny to keep the household running. Dina, my favorite gold rush the Klondike up in the Yukon at the end of the 19th century, but I recently saw a book about a gold rush in an obscure state - Nebraska or something. Not that the state is obscure, but it was a state I never associated with a gold rush. There were also silver and copper rushes in the western mountain states of the U.S. but I guess I ruled those out when I said the girls in the photo weren't miners. Thanks for playing along, Dina. #1 - Yes, it's 20th century, but earlier than the 50s. I like your interpretation of his emotions. Much more positive than my guess but I'll share that later. #2 - Yes, it does look like the women are having fun, doesn't it? And their actual activity is something people do for fun, so that means that no, they're not working at breaking up rocks. #4 - yes, early 1900s however there is something in the photo that gives a better clue to the decade. And yes, it's Regina. I didn't want to put the reference to 'Vintage Regina' in the corner, but I had to credit them somehow and that's what their Facebook page is called. Yes, you're right about the families needing every penny back then, but even when I was 13-14 my parents sent me out to deliver papers because they didn't have to give us an allowance if we were making our own spending money. By the way... can anyone read the newspaper banners? Does it help or hinder you to place the location of the boys? I can't read the banners, but I'm on my cellphone. I did think one said Chicago, but couldn't totally tell. Yes, Suzie, one did say Chicago. Do you think it helps locate the image? I like the first photo the most - the chair seemingly in the middle of nowhere. And what is in the letter? And now I have to go write two blog posts instead of playing. And will just come back for the answers later. Thanks for making us think, Anita! Oh Deb, you are soooooo close for the newsboys. Has anyone thought of any captions?